We’re also so excited to have liZ and Elizabeth from Simple Simon and Company here as our Sew for ME! 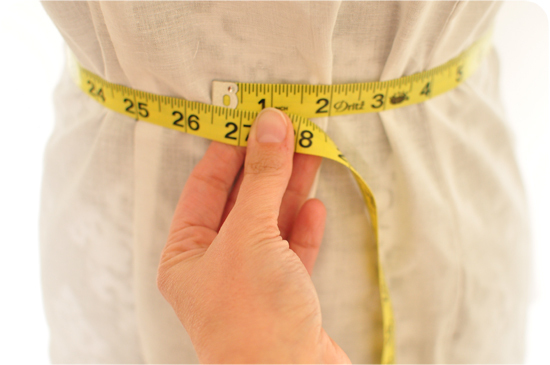 guests today- their directions for taking your own measurements are perfect for this series! For a while we have been trying our hand at designing and drafting our own patterns. Sometimes we are successful and sometimes we fail…miserably. Either way it’s been an adventure and something we’ve wanted to pursue. So a while back we decided that if we were going to continue drafting and designing we wanted to learn how to do it the “right” way. (Don’t get us wrong we think self-teaching and experimentation is AWESOME—that’s how I (liZ) started—but we also felt a need to be “trained” in the classical art of technical sewing. After some searching Elizabeth found us exactly what we wanted and currently we are enrolled in an advanced pattern drafting course. It’s awesome. Our professor, who started her own business before we were born, is literally a wealth of information. What we have gained has been worth all the late nights, travel times, and missed dinners. I only wish we would have found her sooner. As you all know, there is a big difference between sewing for girls and sewing for women. And what we’ve discovered is that when sewing for women the ability to take correct measurements can make all the difference. It’s like the foundation or the canvas for what you are going to create—and if it’s not right nothing you make will be either. (Trust us…we know from experience—one of us, who shall remain nameless, is on her third body draft! 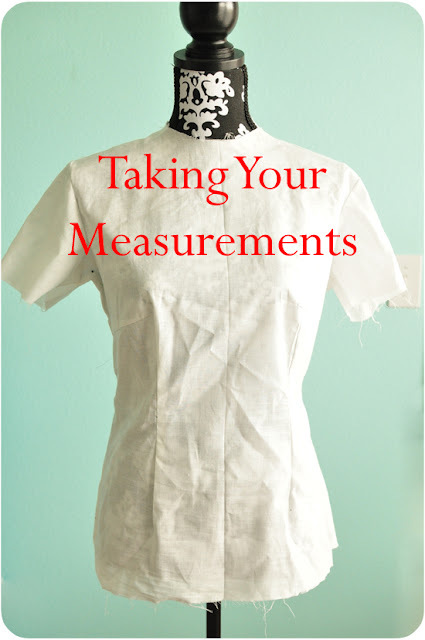 )So today we want to share with you how we’ve learned to take a few (of the seemingly endless measurements) one needs to take to draft a pattern and hopefully this will help you in your sewing pursuits. First things first. Our teacher is switching us to the metric system in this drafting class. It’s been hard. But we think it will be worth it. But, we are showing you in inches today just because it is convenient and ultimately more of what we know here in the States. Also, you want to measure yourself in your underclothing….and nothing else. Now, put your measuring tape around your back and up under your armpits. You should be able to hold the measuring tape tight with your arms down because it is being held so tight right in your armpits. Next, have someone bring the measuring tape around the front to the fullest part of your bust. And record the measurement. For this dress-form lady, the bust is 34 inches. Ok, this may sound simple but first—you have to find your waist. And well most of us are using the wrong measurement….because we don’t wear things at our waists! So, here’s how to find your waist. Stand with your hands on your hips and bend to the side. (Think Richard Simmons here.) Where your side bends (and it is probably a lot higher than you think) is your ACTUAL waist. Mark that spot with your finger. Now take the tape and measure around this line. Record your measurement. This little dress lady is 26.5 inches. There is a formula for finding your hip and your hip placement….but let’s take the easy hip measurement right now. Find the fullest part of your lower tummy and hips (standing in front of a mirror may help you find this spot). 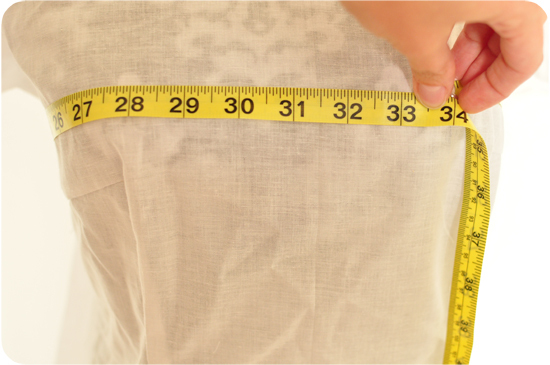 Using your tape measure, record this hip measurement. This dress form is 34 inches. 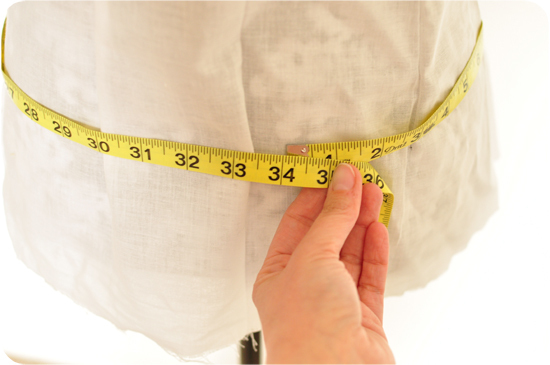 Now you have the three basic measurements that are on the back of most commercial patterns. Or you can use these measurements to draft your own patterns or to change an existing pattern. Yes, there are “x of backs” and “point of busts” or about 20 other measurements in our course but we won’t show you those today….because let’s face it….we still get different measurements than our master teacher! If you too are interested in drafting patterns (which is essentially starting from scratch—not tracing patterns from anything) we started out learning about pattern drafting from books (vintage books are awesome at this). Or even taking a class is a good way to go. The Fashion Institute near us offers 4 different pattern drafting classes based on different techniques and skills. Thank you Kirstin, Jordan and Kelly for inviting us to your Sewing for Me series. Happy measuring and happy pattern drafting! I can’t tell you how much I LOVE having this information on hand! 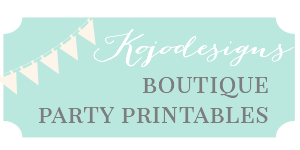 Be sure to head over to check out all of the blog loveliness at Simple Simon & Company. A few favorites? 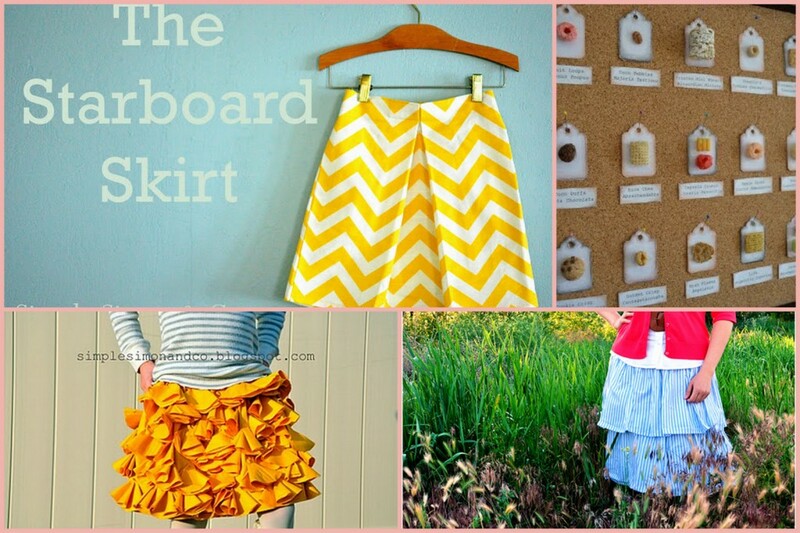 Those Starboard Skirts, that striped ruffled skirt or the oh-so-fabulous bustle skirt? And don’t get me started on how much I love their “The Art of Homemaking” series. even if it is for a little one. 🙂And go say hi at Sewing in No Man’s Land for more Sewing for ME! goodness! And I love it that you offset by making your own patterns- genius! This is incredibly helpful for a beginner like me! Thank you! These directions are great. If you look online for directions for drafting slopers, as I have been recently, you will need to take all those measurements to which you referred. But it’s not very clear where to start that base of neck or nape measurement. Perhaps you would be willing to do the same kind of demo for the other measurements? I’m sure there are many of us who would totally appreciate your efforts! Thanks! Hi could you do a tutorial on how to transfer measurements to fabric, if I wanted to make something such as a long sleeved dress? I love sewing but have never really successfully been able to fit myself correctly. Cannot tell you how many things I have sewn and given up on because the rise is wrong on pants, or the pant legs fit my thighs tight like a sausage casing. I end up angry and hating my body. But in theory, I know a good fit can make even curvy girls look good!